Floridians has some pretty spectacular insects. You have to go looking for most of them, but it’s hard to miss the eastern Lubber grasshopper. 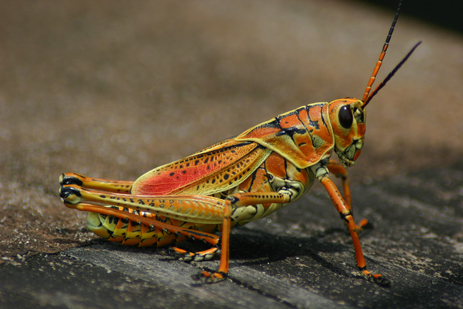 This giant, slow moving grasshopper’s bright orange, yellow and red colors are a warning that it contains toxins and will make any potential predator sick. If for any reason, you fail to heed the color warning and pick it up, the grasshopper makes a loud hissing noise and secretes an irritating foul-smelling foamy spray. These 4-inch grasshoppers are too large and toxic for most natural predators, so they don’t need to move fast. Lubbers cannot fly far, and travel in short clumsy hops, or walk and crawl slowly through the vegetation. They feed on broadleaf plants and can become a nuisance when swarms invade residential areas and feast on garden plants. Lubbers seem to be unaffected by most insecticides, and according to experts at the University of Florida, if they become a garden pest, the best way to get rid of them is to stamp on them, or ‘hand pick’ them and drown them in a bucket of soapy water.